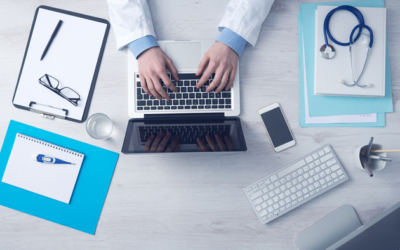 HIPAA Compliance – Where Do I Start? How Important Are Business Associate Agreements? Failure to execute Business Associate Agreements have resulted in fines of tens of thousands to over a million dollars over the past few years. So, they are a pretty important part of maintaining HIPAA compliance. So, what is a Business Associate Agreement? Have a question? Answers to our most frequently asked questions are below. Managed IT Services are proactive functions designed to keep IT systems functioning properly. Rather than the traditional Break/Fix model, where nothing is done until a problem actually happens, Managed IT can usually detect and prevent issues from occurring, resulting in less downtime and minimal loss of productivity. Though the actual services included can vary depending on the needs of the client, they generally include at least: Remote Monitoring and Management, Help Desk, Data Backup/Business Continuity. 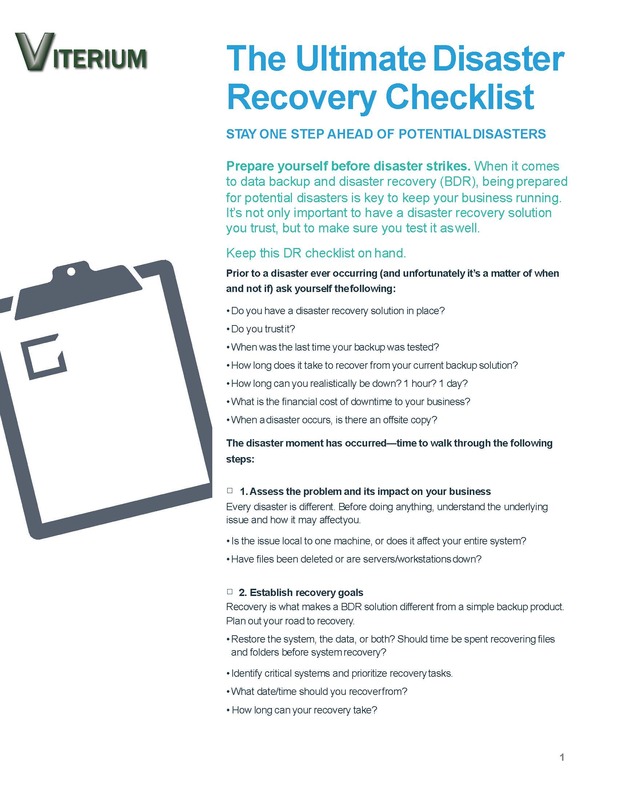 What is the difference between a Data Backup and a true Business Continuity solution? A Data Backup is just that, a backup copy of your organization’s data. While important, just having access to your data doesn’t mean you can continue to operate in the event of a problem. To continue operating the data has to be processed in some way, and for most small to mid-sized organizations that means a local physical server. A hard drive crash or a ransomware infection, two of the more common server problems, will render the server unusable until a replacement drive can be installed or the system is completely wiped, the operating system reinstalled, and the data restored. Recovery time in these circumstances often amounts to a day or more. 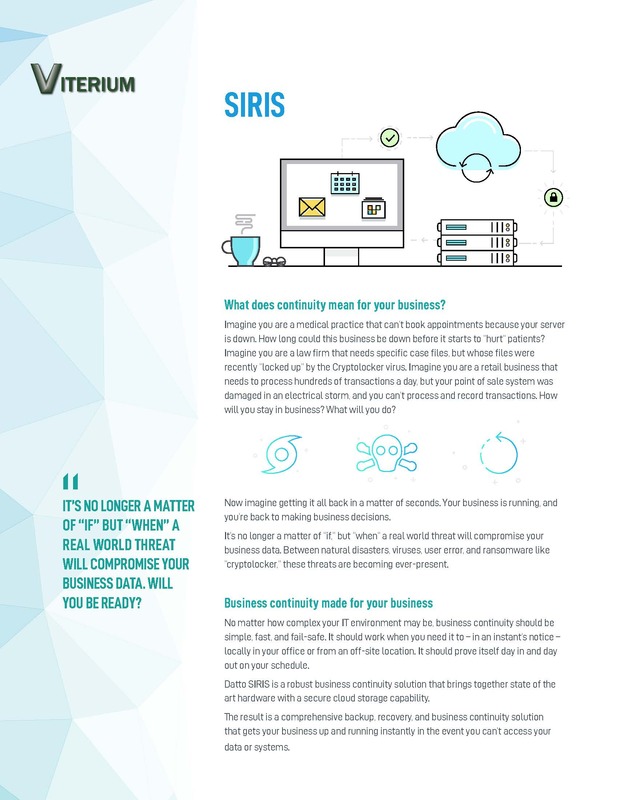 A true Business Continuity solution, on the other hand, includes not just the data, but a means to process that data to continue functioning. 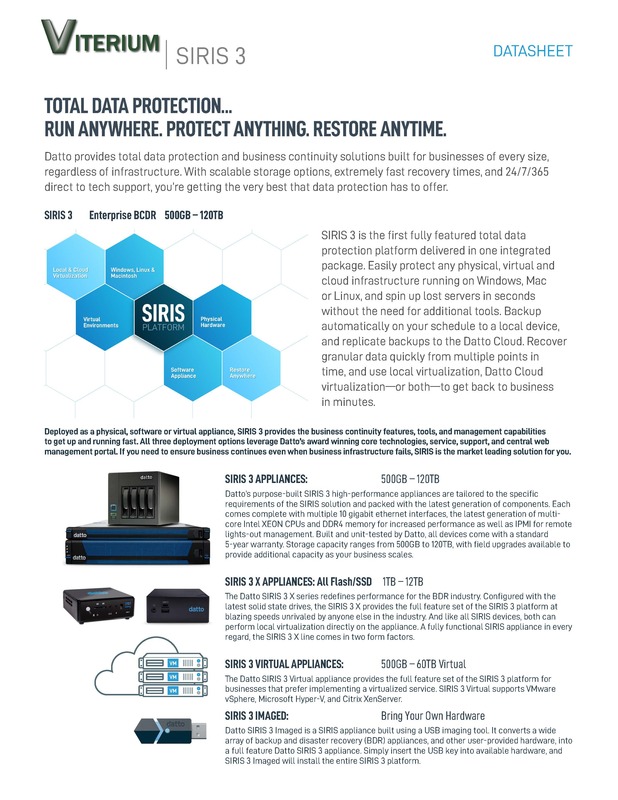 This means the ability to run a virtual instance of the protected server that can provide the same level of access to data and the processes that make it usable. See below for detailed information on some of the solutions we provide. Below you will find helpful links to other resources relating to IT in general and Healthcare IT in particular. Should Your Company Outsource IT? 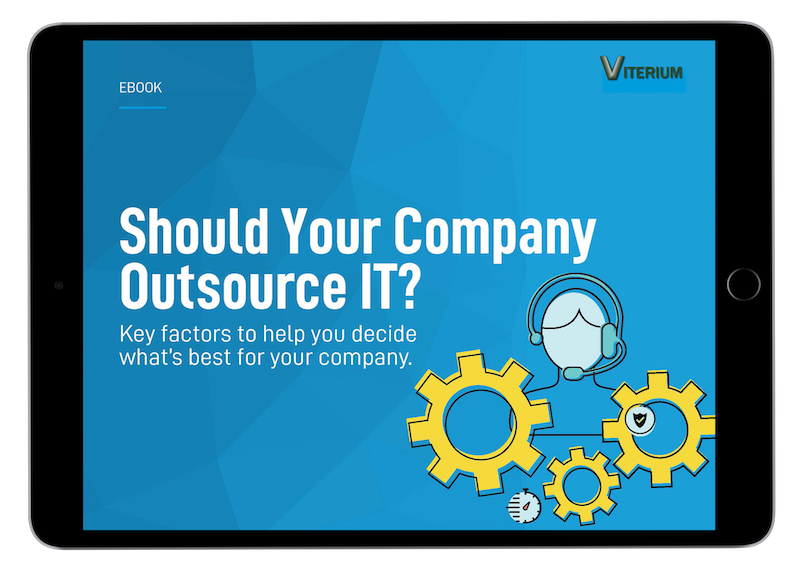 In this free eBook, we provide an overview of the benefits of the services we can provide so you can make an informed decision whether or not outsourcing IT is right for you. VITERIUM, LLC (“us”, “we”, or “our”) operates the www.viterium.net website (the “Service”). Controller. We may use the services of various Service Providers in order to process your data more effectively. time spent on those pages, unique device identifiers and other diagnostic data. VITERIUM will also retain Usage Data for internal analysis purposes. Usage Data is generally retained for a shorter period of time, except when this data is used to strengthen the security or to improve the functionality of our Service, or we are legally obligated to retain this data for longer time periods. us, please note that we transfer the data, including Personal Data, to United States and process it there. Under certain circumstances, VITERIUM may be required to disclose your Personal Data if required to do so by law or in response to valid requests by public authorities (e.g. a court or a government agency). VITERIUM aims to take reasonable steps to allow you to correct, amend, delete, or limit the use of your Personal Data. account settings section. If you are unable to change your Personal Data, please contact us to make the required changes. want it to be removed from our systems, please contact us at info@VITERIUM.net. You have the right to data portability for the information you provide to VITERIUM. You can request to obtain a copy of your Personal Data in a commonly used electronic format so that you can manage and move it. VITERIUM does not conduct remarketing campaigns. Our Service does not address anyone under the age of 13 (“Children”). We do not knowingly collect personally identifiable information from anyone under the age of 13. If you are a parent or guardian and you are aware that your child has provided us with Personal Data, please contact us. If we become aware that we have collected Personal Data from children without verification of parental consent, we take steps to remove that information from our servers. Welcome to the website (the “Website”) of Viterium, LLC (“Viterium”). Viterium and its associates provide their services to you subject to the following terms and conditions. If you visit this website, or purchase products and services from Viterium you accept these conditions. Please read them carefully. Please note that all hardware and software is warranted by the manufacturer and not by Viterium. All warranty information will be provided upon request. Please note all sales are final and no refunds will be issued. In the unlikely event a refund is authorized it is subject to an administrative fee of 50%, not including any other fees or charges that will be provided upon issuance of any refund amount. Viterium reserves the right to issue a credit towards services only in lieu of a refund. When you visit Viterium or send e-mails to us, you are communicating with us electronically. You consent to receive communications from us electronically. We will communicate with you by e-mail or by posting notices on this Website. You agree that all agreements, notices, disclosures and other communications that we provide to you electronically satisfy any legal requirement that such communications be in writing. All content included on this Website, such as text, graphics, logos, button icons, images, audio clips, digital downloads, data compilations, and software, is the property of Viterium, its content suppliers, or by third parties who have licensed their materials to Viterium and is protected by U.S. and international copyright laws. The compilation of all content on this Website is the exclusive property of Viterium, with copyright authorship for this collection by Viterium, and protected by international copyright laws. Viteriumtrademarks may not be used in connection with any product or service that is not Viterium, in any manner that is likely to cause confusion among customers, or in any manner that disparages or discredits Viterium. All other trademarks not owned by Viterium or its subsidiaries that appear on this Website are the property of their respective owners, who may or may not be affiliated with, connected to, or sponsored by Viterium or its subsidiaries. Viterium grants you a limited license to access and make personal use of this Website and not to download (other than page caching) or modify it, or any portion of it, except with express written consent of Viterium. This license does not include any resale or commercial use of this Website or its contents: any collection and use of any product/service listings, descriptions, or prices: any derivative use of this Website or its contents: any downloading or copying of account information for the benefit of another merchant: or any use of data mining, robots, or similar data gathering and extraction tools. This Website or any portion of this Website may not be reproduced, duplicated, copied, sold, resold, visited, or otherwise exploited for any commercial purpose without express written consent of Viterium. You may not frame or utilize framing techniques to enclose any trademark, logo, or other proprietary information (including images, text, page layout, or form) of Endecom and our associates without express written consent. You may not use any meta tags or any other “hidden text” utilizing Viterium name or trademarks without the express written consent of Viterium. Any unauthorized use terminates the permission or license granted by Viterium. You are granted a limited, revocable, and nonexclusive right to create a hyperlink to the home page of Viterium so long as the link does not portray Viterium, its associates, or their products or services in a false, misleading, derogatory, or otherwise offensive matter. You may not use any Viterium logo or other proprietary graphic or trademark as part of the link without express written permission. Unless otherwise explicitly specified on the Website, the information on all of the Website is intended solely for use and access by persons residing in the United States, its territories, and possessions. Viterium controls and operates its Website from offices located in the United States and makes no representations or warranties that the information, products or services contained on the Website is appropriate for use or access in other locations. Anyone using or accessing any of the Website from other locations does so on their own initiative and are responsible for compliance with local United States laws, if and to the extent applicable. Use of certain features on the Website might be limited and/or require registration. Viterium shall have the right, in its sole discretion, to refuse or restrict anyone from access to the Website at any time for any reason. Upon registration, you may select your user ID and password (collectively “Password”) for access to and use of the applicable portion of the Website. When registering for your Password, you must provide accurate and complete information. 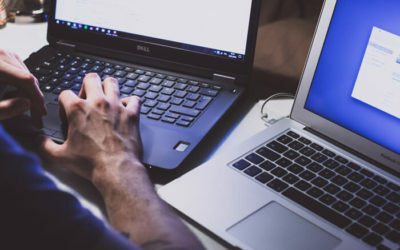 If you use this Website, you are responsible for maintaining the confidentiality of your account and Password and for restricting access to your computer, and you agree to accept responsibility for all activities that occur under your account or Password. If you are under 18, you may use our Website only with involvement of a parent or guardian. Viterium and its associates reserve the right to refuse service, terminate accounts, remove or edit content, or cancel orders in their sole discretion. You agree to use your best efforts to maintain the security of your Password. You shall not disclose your Password to anyone else, and you shall not use anyone else’s Password. You agree to notify Viterium immediately about any unauthorized use of your Password or any breach of security. You further agree that Endecom shall not be responsible for your failure to comply with this Section or any loss or damage arising out of, or related to, your use of your Password by you or anyone other than Endecom. Visitors may post reviews, comments, and other content: and submit suggestions, ideas, comments, questions, or other information, so long as the content is not illegal, obscene, threatening, defamatory, invasive of privacy, infringing of intellectual property rights, or otherwise injurious to third parties or objectionable and does not consist of or contain software viruses, political campaigning, commercial solicitation, chain letters, mass mailings, or any form of “spam.” You may not use a false e-mail address, impersonate any person or entity, or otherwise mislead as to the origin of a card or other content. Viterium reserves the right (but not the obligation) to remove or edit such content but does not regularly review posted content. If you do post content or submit material, and unless we indicate otherwise, you grant Viterium and its associates a non-exclusive, royalty-free, perpetual, irrevocable, and fully sublicensable right to use, reproduce, modify, adapt, publish, translate, create derivative works from, distribute, and display such content throughout the world in any media. You grant Viterium and its associates and sublicensees the right to use the name that you submit in connection with such content, if they choose. You represent and warrant that you own or otherwise control all of the rights to the content that you post: that the content is accurate: that use of the content you supply does not violate this policy and will not cause injury to any person or entity: and that you will indemnify Viterium or its associates for all claims resulting from content you supply. Viterium has the right but not the obligation to monitor and edit or remove any activity or content. Viterium takes no responsibility and assumes no liability for any content posted by you or any third party. THIS WEBSITE IS PROVIDED BY VITERIUM ON AN “AS IS” AND “AS AVAILABLE” BASIS. VITERIUM MAKES NO REPRESENTATIONS OR WARRANTIES OF ANY KIND, EXPRESS OR IMPLIED, AS TO THE OPERATION OF THIS SITE OR THE INFORMATION, CONTENT, MATERIALS, OR PRODUCTS INCLUDED ON THIS SITE. YOU EXPRESSLY AGREE THAT YOUR USE OF THIS SITE IS AT YOUR SOLE RISK. TO THE FULL EXTENT PERMISSIBLE BY APPLICABLE LAW, VITERIUM DISCLAIMS ALL WARRANTIES, EXPRESS OR IMPLIED, INCLUDING, BUT NOT LIMITED TO, IMPLIED WARRANTIES OF MERCHANTABILITY AND FITNESS FOR A PARTICULAR PURPOSE. VITERIUM DOES NOT WARRANT THAT THIS SITE, ITS SERVERS, OR E-MAIL SENT FROM VITERIUM ARE FREE OF VIRUSES OR OTHER HARMFUL COMPONENTS. VITERIUM WILL NOT BE LIABLE FOR ANY DAMAGES OF ANY KIND ARISING FROM THE USE OF THIS SITE, INCLUDING, BUT NOT LIMITED TO DIRECT, INDIRECT, INCIDENTAL, PUNITIVE, AND CONSEQUENTIAL DAMAGES. CERTAIN STATE LAWS DO NOT ALLOW LIMITATIONS ON IMPLIED WARRANTIES OR THE EXCLUSION OR LIMITATION OF CERTAIN DAMAGES. IF THESE LAWS APPLY TO YOU, SOME OR ALL OF THE ABOVE DISCLAIMERS, EXCLUSIONS, OR LIMITATIONS MAY NOT APPLY TO YOU, AND YOU MIGHT HAVE ADDITIONAL RIGHTS. UNDER NO CIRCUMSTANCES AND UNDER NO LEGAL OR EQUITABLE THEORY, WHETHER IN TORT, CONTRACT, STRICT LIABILITY OR OTHERWISE, SHALL VITERIUM OR ANY OF ITS EMPLOYEES, DIRECTORS, OFFICERS, AGENTS, VENDORS, OR SUPPLIERS BE LIABLE TO YOU OR TO ANY OTHER PERSON FOR ANY INDIRECT, SPECIAL, INCIDENTAL OR CONSEQUENTIAL LOSSES OR DAMAGES OF ANY NATURE ARISING OUT OF OR IN CONNECTION WITH THE USE OF OR ACCESS TO OR INABILITY TO USE OR ACCESS THIS WEBSITE, INCLUDING, WITHOUT LIMITATION, DAMAGES FOR LOST PROFITS, LOSS OF GOODWILL, LOSS OF DATA, WORK STOPPAGE, ACCURACY OF RESULTS, OR COMPUTER FAILURE OR MALFUNCTION, EVEN IF AN AUTHORIZED REPRESENTATIVE OF VITERIUM HAS BEEN ADVISED OF OR SHOULD HAVE KNOWN OF THE POSSIBILITY OF SUCH DAMAGES. YOU AGREE THAT YOU, AND NOT VITERIUM, SHALL ASSUME THE ENTIRE COST OF ALL NECESSARY SERVICING, REPAIR OR CORRECTION IN THE EVENT OF ANY SUCH LOSS OR DAMAGE. IN NO EVENT WILL VITERIUM BE LIABLE FOR ANY DAMAGES IN EXCESS OF ONE HUNDRED UNITED STATES DOLLARS ($100.00) FOR ANY CLAIMS ARISING FROM OR RELATED TO THIS TERMS & CONDITIONS. YOU AGREE TO DEFEND, INDEMNIFY AND HOLD VITERIUM AND ITS OWNERS, AFFILIATES, SUBSIDIARIES, DIRECTORS, SHARE HOLDERS, OFFICERS, EMPLOYEES, AGENTS, AND CONTRACTORS HARMLESS FROM AND AGAINST ANY AND ALL CLAIMS, DAMAGES, COSTS, AND EXPENSES, INCLUDING ATTORNEYS’ FEES, ARISING FROM OR RELATED TO (I) YOUR USE OF THIS WEBSITE AND/OR (II) YOUR BREACH OF ANY OF THE TERMS OR CONDITIONS OF THIS TERMS & CONDITIONS. By visiting Viterium, you agree that the laws of the state of Pennsylvania, United States, without regard to principles of conflict of laws, will govern these Conditions of Use and any dispute of any sort that might arise between you and Viterium or its associates. Any dispute relating in any way to your visit to Viterium or to products/services you purchase through Viterium shall be submitted to confidential arbitration in Pennsylvania, United States, except that, to the extent you have in any manner violated or threatened to violate Viterium intellectual property rights, Viterium may seek injunctive or other appropriate relief in any state or federal court in the state of Pennsylvania, United States, and you consent to exclusive jurisdiction and venue in such courts. Arbitration under this agreement shall be conducted under the rules then prevailing of the American Arbitration Association. The arbitrator’s award shall be binding and may be entered as a judgment in any court of competent jurisdiction. 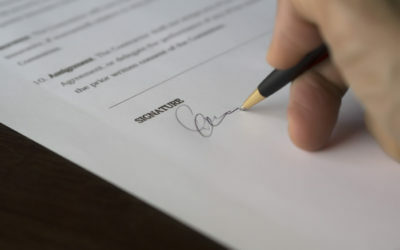 To the fullest extent permitted by applicable law, no arbitration under this Agreement shall be joined to an arbitration involving any other party subject to this Agreement, whether through class arbitration proceedings or otherwise. Please review our other policies posted on this Website. These policies also govern your visit to Viterium. We reserve the right to make changes to our Website, policies, and these Conditions of Use at any time. If any of these conditions shall be deemed invalid, void, or for any reason unenforceable, that condition shall be deemed severable and shall not affect the validity and enforceability of any remaining condition.